Finally, Percy Mahinda Rajapaksa seems to have taken the plunge. Last week’s Joint Opposition rally at Ratnapura marks a significant turning point in Rajapaksa’s political journey. After much prevarication, the former President appears to believe that the doors of the Sri Lanka Freedom Party (SLFP) are closed for him at least in the immediate future and that he needs a different vehicle to continue his political journey. It must have been a difficult path because Rajapaksa is just a few weeks shy of his seventy first birthday and though appearing to be in good health, it is a rather late age to be launching new political parties. He must also know that history is against him: no ‘third force’ has ever really made it to the top and gained power in post-independent Sri Lanka. Those who are close to Rajapaksa however do not see his decision to from a new party as an aberration: they say this is Rajapaksa at his best- out of power and fighting for survival. Indeed, despite being universally credited with ending the war with the Liberation Tigers of Tamil Eelam (LTTE), Rajapaksa is arguably a better politician in the opposition than when he was in the government. It is relevant to note that Rajapaksa’s formative years as a politician were spent in the opposition. When he first entered Parliament in the 1970 landslide for the United Front government led by Sirima Bandaranaike, he was the youngest Member in that Parliament at the age of just 24. He spent his time in the back benches- and in Law College, where he qualified as an Attorney-at-Law. In 1977, the avalanche that swept J. R. Jayewardene and the United National Party (UNP) in to power also booted Mahinda Rajapaksa out of Parliament. He lost the Rajapaksa family bastion of Beliatta to Dr. Ranjit Atapattu. As President Jayewardene chose to extend the life of the 1977 Parliament with a referendum instead of conducting a general election, Rajapaksa was in political wilderness for twelve long years from 1977 to 1989. Few people however remember that Jayewardene decreed that all UNP parliamentarians whose constituencies voted against the extension of the life of the 1977 Parliament should resign. He then held by-elections for those electorates in May 1983. The Beliatta electorate was among them and Mahinda Rajapaksa was again defeated by Ranjit Atapattu by almost 3,000 votes. It was 1989 when Rajapaksa reappeared on the national political stage. By then, Ranasinghe Premadasa had assumed office as President and the country was burning both in the North and the South because of twin rebellions- from the LTTE in the North and by the Janatha Vimukthi Peramuna (JVP) in the South. This was where Rajapaksa cut his teeth in opposition politics and emerged as a force to reckon with among all the rising stars of the SLFP. He was famously detained at the Katunayake airport in September 1990 while attempting to ‘smuggle’ documents to the United Nations in Geneva relating to alleged disappearances in Sri Lanka and this led to a landmark fundamental rights case. He was also instrumental in organising many an opposition protest campaign against the Premadasa regime, an administration which was characterised by President Premadasa’s desire to be in absolute control of all aspects of government. These included the successful ‘Paada Yathra’ and ‘Jana Gosha’ campaigns. This is where Rajapaksa excelled as a politician- as a street fighter, literally and metaphorically. 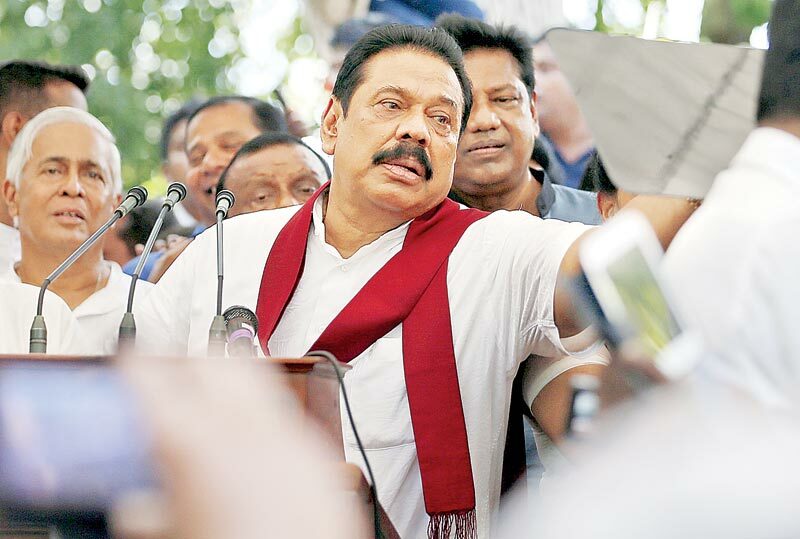 However, with the SLFP gravitating towards leadership by the Bandaranaike clan, Rajapaksa found that by the time the party was on the cusp of returning to power, he had been side-lined. That was because the SLFP leadership had been handed over to Chandrika Kumaratunga and not Anura Bandaranaike, the two Bandaranaike siblings who were battling for what they believed was the family heirloom. In this tussle, Rajapaksa openly sided with Bandaranaike. As a result, his relationship with Kumaratunga was always strained and when in government in 1994 she initially offered him only the portfolios of Labour and Fisheries despite being a frontbencher in the party by then. At one point, he was dubbed the ‘reporter’ by Kumaratunga and accused of leaking Cabinet discussions to the media. Rajapaksa however bided his time and struck a decade later when he successfully orchestrated a campaign to move the Supreme Court, headed by his friend, Chief Justice Sarath N. Silva, to declare that Kumaratunga’s tenure ended after eleven years- and not twelve as she had imagined it to be. Kumaratunga has never forgiven Rajapaksa for this and although most of her loyalists rallied around Rajapaksa after he won the presidential election in 2005, the fracture lines were beginning to emerge in the SLFP, held together only by the heady amalgam of being in power and the ‘cross-over’ culture where not only politicians of the SLFP but also the UNP flocked towards the President, seduced by the prospect of enjoying the perks of a ministerial portfolio. In such a context, it is remarkable that when Rajapaksa lost power to President Maithripala Sirisena in January 2015 and the SLFP was plunged into crisis yet again during the August 2015 general election campaign, some parliamentarians from the SLFP have continued to pledge their loyalty to Rajapaksa. Leaders of ‘fringe’ parties such as Wimal Weerawansa, Dinesh Gunawardena, Udaya Gammanpila and Vasudeva Nanayakkara have little choice: without the Rajapaksa talisman, their parties will be wiped out. SLFP loyalists on the other hand have a lot to lose by consorting with Rajapaksa but they continue to do so, risking their standing within the party as well as the SLFP vote base. Whether this is sufficient to carry a new political party to gain power is the question the Rajapaksa camp must be pondering. That though is not the only issue looming large for Mahinda Rajapaksa and his inner circle of advisors. The technicalities of forming a political party and having it registered with the Department of Elections are being dealt with as expeditiously as possible although there has been no public announcement of the party’s name, colour or symbol just yet. That could be reserved for a grand launch of the party on a larger scale than what was seen at Ratnapura last week. It is also no secret that most stalwarts in the Rajapaksa camp are the subject of various probes and inquiries. Many are out on bail, having been charged with numerous offences. Although legal proceedings in these matters and potential conviction, if any, could be years away, this is an issue which cannot be dismissed lightly. Most of the practical arrangements for the proposed new party are being spearheaded by the former Minister of Economic Development Basil Rajapaksa. While everyone acknowledges the younger Rajapaksa as a dynamic political organiser there was widespread condemnation of his style of management in the aftermath of Mahinda Rajapaksa’s election defeat early last year, so much so that he took wing to the United States and did not return to the country for many months. Seniors in the SLFP were perturbed that Basil Rajapaksa rode roughshod over them and there is some alarm that this may happen all over again in the new party. However, as things stand now, it is almost certain that Basil Rajapaksa will play a greater role than he ever played in the SLFP, in the proposed new party. Hindsight, they say, is a wonderful thing. In the later years of his life, Mahinda Rajapaksa has made some notable political blunders. Calling presidential elections ahead of schedule is one of them- had he not done so, he would be in power even today. Handing over the leadership of the SLFP to President Sirisena on a platter without seeking any assurances for his own political future was another. Rajapaksa could have potentially negotiated a role in government in return for the smooth transition of the party leadership. It remains to be seen whether launching a new political party will be an addition to this list. That depends not only on Rajapaksa’s own handling of future events but also the response of President Sirisena and the mainstream SLFP as well as the popularity of the so-called ‘national unity’ government. Whether the so-called ‘Mahinda Sulanga’ is just a gentle breeze or a political cyclone is the big question. Mahinda Rajapaksa though must be hoping that it is the end of the beginning rather than a beginning of the end.